I haven’t seen Cats since sometime in 2000. Will and I went to see at in its original Broadway home at the Winter Garden Theatre before it closed that fall. For me, it was the last of many visits to the show, the first of which happened in Birmingham, Alabama, during its first national tour. 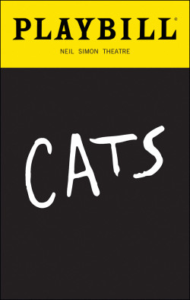 While A Chorus Line was my first Broadway touring company to see, Cats was the first of the “mega musicals” I saw. I was enthralled with the huge junk yard strewn across the stage and all the effects, like the giant tire taking flight at the end of the show. I have to admit I was disappointed when I heard the show was coming back to Broadway without any updates. Yes, Andy Blankenbuehler, Tony winning choreographer of Hamilton, was freshening the choreography and the “Growltiger’s Last Stand” number was removed for cultural sensitivity, but nothing else was slated to change. I’d hoped the show would get a makeover like the recent revival of Les Miserables, which took a great show and made it seem as though I was seeing it for the first time rather than the fifteenth. However, it seems that Cats is theatrical comfort food for me. Walking in and seeing the familiar junk yard along with the familiar orchestrations gave me goosebumps and I throughly enjoyed the show. Blankenbuehler didn’t do too much to the choreography as far as I could tell. . There were some spots in uptempo songs, like “Rum Rum Tugger,” “The Jellicle Ball” and “Mr. Mistoffelees” that some of his signature moves were on display. But, again, it was mostly like revisiting an old friend. A couple of stand out performances too mention. Tyler Hanes was stunning as Rum Rum Tugger, bringing a sly sexuality to the role that was, frankly, hot. Even beyond his number, the way he moved around the stage periodically causing trouble and the way he interacted with Mistofflees were a lot of fun. Meanwhile, Ricky Ubeda, season 11 So You Think You Can Dance winner, owned the stage during “Mr. Mistoffelees.” I think Blankenbuehler, created some moves knowing Ubeda was in the role as there were quite a few moves that highlighted is agility. He was wonderful to watch during the entire show. 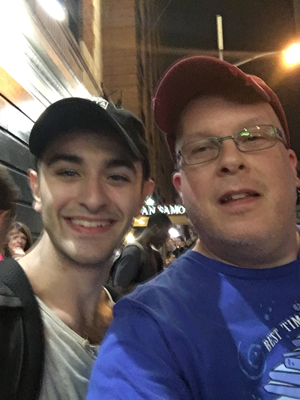 I also took a moment post show to get an autograph and selfie with him since he’s one of my major SYTYCD crushes. Regardless of Lewis absence, I loved the show and am glad I relived the magic. Even more so, it’s great to see the show in such great shape after sixteen years away.